Last year I wanted to read twenty four books and I am very happy to say that I accomplished that! I think the reason I was successful was because I had a clear goal, planned to make it happen (two books a month which means one book every two weeks), and stayed on schedule. I decided to do something similar this year with my sewing plans. My plan this year is to sew at least one item of clothing a month, which means twelve different pieces. 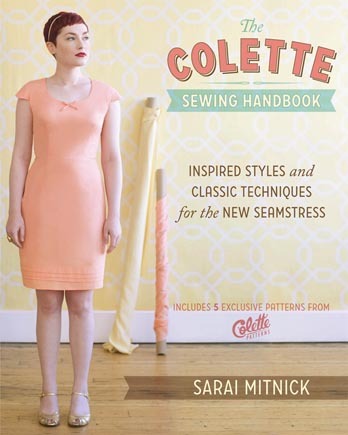 I am doing this because I am so inspired by the new Colette Sewing Handbook from Colette Patterns. When it comes to garment sewing I am completely self taught and easily intimidated. After reading through the book so many previously confusing things make much more sense and I want to put my new knowledge to use. My first five garments are going to be from the included patterns in the book pictured above. The next seven patterns will be purchased from their website. Twelve articles of clothing made from Colette Patterns = 2012: The Year of Colette. Now, I know that to some twelve pieces is not that many, I mean Veronica and Debi make something every week, but to me twelve is a lot! 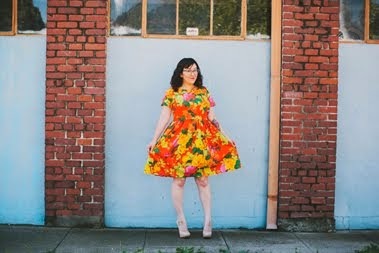 I don't have a ton of sewing experience, but I feel like I can reach my goal! I hope you enjoy watching my progress. Right on! What a great goal to set yourself. I agree, more than one a month sounds crazy to me, maybe as I get better I'll be able to step up my game like some of the other ladies online that I am impressed with but damn...one fully made item a week just blows my mind. I am self taught too and just plain slow. I look forward to following your progress. That is a great goal! I am also self taught, but my problem is that I want to finish a project as soon as I start it, so I will work for 8 hours straight (literally) trying to get the thing done! After doing a full day of teaching, this isn't really conducive to success. Sewly a Harpist - I feel like an item of clothing a month is doable for me. Anything more might be pushing it! I was so pumped for you when you did your dress in under a month. That's so good!!!! I'm glad to hear that the patterns are easy to follow. I can't wait to get started! Ooooo, what a great idea! I love love love Colette Patterns! My book made it to Germany and then I went a little crazy when they had the Black Friday sale, so I'm more than set. Mind if I join your challenge? We can keep each other honest. lol :) PS: I did finally finish my Sorbetto and posted about it. If you check it out, keep in mind that those are the most unflattering pictures my husband has ever taken of me. I swear he does it so I'll stop asking him to be my photographer. Andrea- Yes, please do the challenge also! How fun! And your Sorbetto looks great!! You can doooo iiiit!!! That was my goal in 2009 - a garment a month. I came up a little shy, but cut myself some slack due to family junk. Activity breeds activity, right?! lladybird - I love the Colette dresses you have sewn up! threadsquare - I'm crossing my fingers! 2012 is going to be a busy year already, but I agree with "activity breeds activity!" You can totally do it! Even with muslins thrown in i bet you'll be on target...oooh and think of how wonderful your wardrobe will be this time next year. The Old Fashioned Way - My longterm goal is to have a closet filled completely, or almost completely, with things I have made. I like owning things that no one else owns and you can't beat the quality when you make things yourself! Making these 12 patterns will get me started on the right path. Awesome!! We can sew along together! Which pattern do you want to sew up first? Sarah - I'm going to start with the Meringue. Which one are you starting with? How fun, we can be sew along buddies!! !